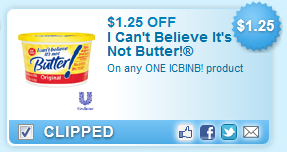 The ICBINB tubs often go on sale for about $2.00 each, so this coupon would make it an great deal! Found under zip code 90210, 1st page of Food category. You can usually print each coupon twice per computer! Print quickly - they may go fast! Don't forget to sign up for free money! GiftHulk are free digital coins that you can trade for over 100 brand name gift cards.